Hello! Somehow it’s the end of October and already time for another J.Crew rollout. This past rollout had a lot of spring looking items – from a color palette and design standpoint so I’m hopeful that the holiday rollout (November 7) will have more winter-y items. But nonetheless, there were still some items to love and a few that I would gladly wear in another season. I took a lot of photos so I’ll probably split in to two posts. First up, the Double-Breasted Coat in Oxford Check. This coat sold out immediately upon rollout but they must have replenished stock because it is back in a full size run online and my store had a whole rack of them. This print also comes in a Mini Skirt. I would have loved to see a blazer or a pencil skirt in this print as I cannot quite do the mini thing. The skirt comes in petite and regular length. I’m wearing a size 10 in this coat so I would say it definitely has a generous fit as I’m usually a 12 in their coats. I could comfortably button up the coat and it has a pretty pinstripe and yellow piped lining inside which is always a fun touch. This isn’t a must have for me but it’s a fun coat and it’s nice to see a slightly different style since we have pretty much seen the same lineup of coats the past few years. I am good in the coat department this year (famous last words) so unless this hit crazy sale, I’m staying put. Next up, the Gayle Tie-Neck Sweater. This comes in heather graphite and heather muslin (read: ivory) but my store only had the grey. There were two left to try on in store so this must be a popular one. The wool on this was on the softer side but I do worry this one might pill. Next was a total love, the Cape Scarf in Oversized Plaid. This comes in grey/ivory (shown) and navy/ivory; although the reviews say that the color mix is actually navy and grey. This style also comes in a different plaid print as well. 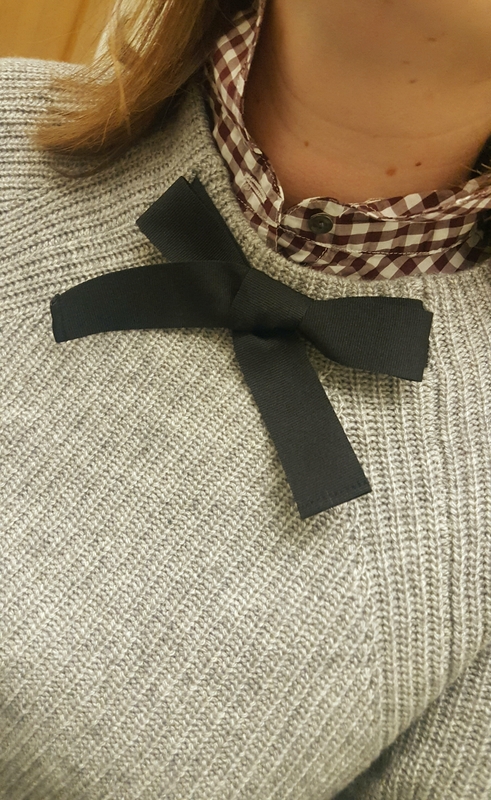 I’m wearing it with the Tissue Turtleneck in Stripe which is a staple in my closet. I love the easy nature of this shawl and it feels nice and cozy without being super bulky. I’m stripesick, I know, but I love the lean fit of this turtleneck and it’s a great layering piece. Next up, the Tippi Sweater in Embroidered Stars. I’m admittedly not one for cutesy embellishments on stuff (fruit, critters, etc.) but this is really well done and I like that the stars are sewn in to the sweater. It’s a really fun sweater. I’m wearing a size medium which is what seems to be my go to size in the Tippis lately. I probably could go to a large for a more relaxed fit. The sweater itself is navy and the gold thread is a true gold but it’s not obnoxious or over sparkly. I think this will be a popular item. Last up for now, the Supersoft Wool Sweater in Multistripe. Reading the name of this sweater, I am not sure that I would call this sweater super soft, but it was pretty soft. The knit is a waffled knit and it is all wool, which is a nice departure from some of the blends we’ve been seeing. I’m not a huge fan of the color mix on this, and I feel like we’ve seen this before at other retailers (Gap, etc.) I’m wearing a medium and it was a good fit but I could have sized up for a more relaxed fit. There are still a few items I want to try that my store didn’t have, including the Lightweight Wool Jackie Cardigan in Argyle and matching shell. And finally, here’s a better shot of the shoes I’m wearing in these photos – Slingback Flats in Snakeskin Printed Leather. 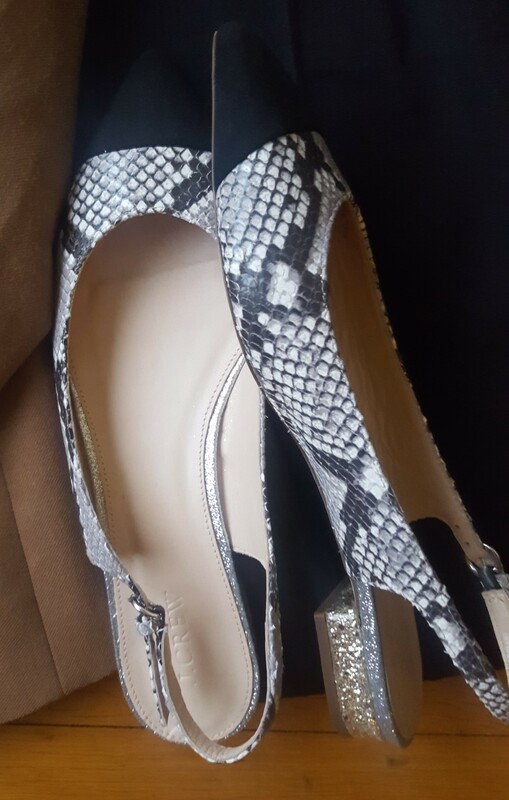 I found these to be true to size – the back strap is very comfortable and adjustable and while the glitter shed a little bit it wasn’t too bad. I need to spray them to prevent further shedding. So, there you have it, some of the November new arrivals. Any favorites? Not so much? Would love to hear what you think and thanks for visiting!